"Microsoft's late-comer smartphone OS is expected to grow its market share from two per cent in 2010 to 3.8 per cent this year, a downward revision of IDC's previous forecast in March of 5.5 per cent.That's a relatively tiny share of the market, particularly for an OS that many people would consider a potential third rival to join in the battle between Google's Android and Apple's IOS, but the real strength of Windows Phone 7 will appear during 2012 to 2015, the report predicts, when IDC expects to see WP7 market share increase significantly to 20.3 per cent." Analysts love to forecast, and the latest by IDC estimates that Windows Phone 7 will take second place with 20.3 percent behind Android with 43.8 percent by 2015. This is a slight downward revision from the previously estimated 20.9 percent. 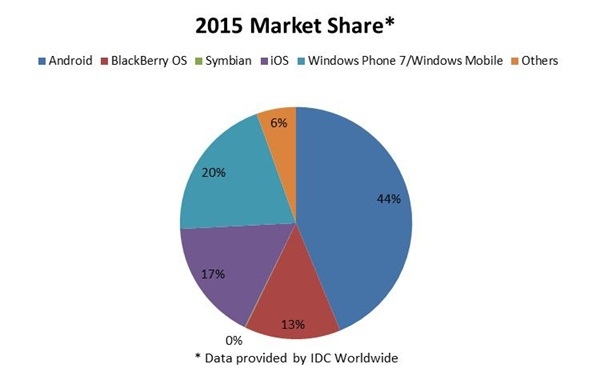 The disaster that is Symbian will drop from its current 20.6 percent all the way down to a measly .1 percent. This is of course expected, but it is still sad to see an operating system go extinct. I am pretty sure that by 2013 we will have Windows 8 running on MS smartphones, 2015? W9 or W10. Hopefully they will be better than WP7, a goal not so hard to achieve honestly. Said that it is unknown what Android and Apple will bring to the table so these kind of forecasts seems pretty weak to me. Not to mention the arbitrary assumption that most of the people using Nokia now will jump to MS OS.